In 2008 has been built sailboat Jeanneau Prestige 46 named The Colonial Sun. This yacht is placed in port Tivat in the region close to Kotor in Montenegro. You can accommodate up to 9 pax on the boat The Colonial Sun. Layout of beds is 9 (6+2+1). There are 4 cabins situated below yacht's deck. The Colonial Sun has 2 heads. 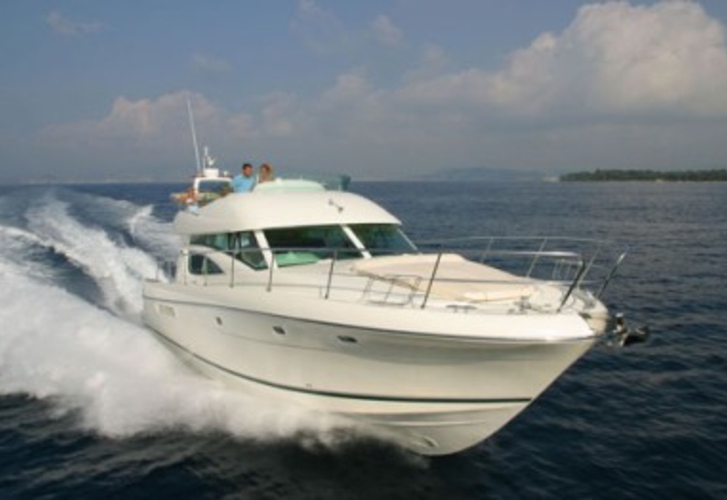 Use our website to find different yachts by going to this section: Motorboats Kotor. In this sailboat there is engine 500. With 14.55 meters of LOA and 4.36 meters of width The Colonial Sun provides enough space for comfortable sailing. Jeanneau Prestige 46 The Colonial Sun is equipped with: Air conditioning, TV, Bed linen & towels, Fishfinder, Plotter gps in cockpit, Gps plotter, Radar, Hydraulic gangway, generator, Outboard engine. . Deposit accounts for 2800.00 EUR. You can see other yachts by navigating to the section Motorboats Tivat.